The core curriculum at Villa Maria is designed to help each student make maximum progress on his or her individual goals. Because our students come to Villa Maria with a variety of learning difficulties, teachers employ an eclectic approach, adapting and modifying methods of instruction to meet individual student needs. Lessons are multisensory and address the multiple intelligences of the students. Teachers use direct instruction, peer cooperative learning activities, hands-on, real life experiences, repetition, and review as required. Students develop basic skills necessary for learning as well as critical thinking skills and a deeper understanding of concepts. Morning classes are one hour long and focus on development of reading, math, and language arts skills. Students are grouped according to their abilities and skills in these subjects. For afternoon classes students are grouped by grade level. The curriculum includes science, social studies, study skills, art, music, keyboarding, word processing, writing, and religious or ethics instruction for all students. Curriculum is theme-based and integrated throughout the content areas. Visual and auditory perception instruction is included in the younger students’ curriculum. The physical education program emphasizes individual goals, self confidence, and all facets of visual motor development. Health education is integrated into the curriculum. A formal social skills and guidance program is incorporated into the curriculum. The school social worker conducts social skills classes and also meets with individual students as well as small groups of students who share similar concerns. In conjunction with the Student Council, the program provides opportunities to develop citizenship, leadership, responsibility, and moral standards of behavior. 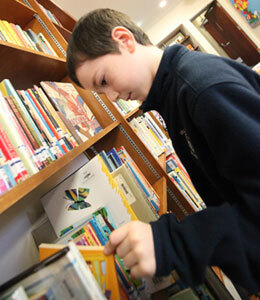 The Villa Maria Reading Curriculum is designed to accommodate both strengths and weaknesses in reading. In some cases it is necessary to remediate weaknesses in decoding, fluency, and comprehension. For other students reading may be a strength, and a higher level curriculum is provided. Strategies and materials are chosen accordingly. Teachers use the Lindamood-Bell Phoneme Sequencing Program for students with decoding weakness. This is a multisensory program that directly develops phonemic awareness by integrating visual, auditory, and oral-motor feedback. Students not only learn phonics rules but are also enabled to apply these phonics rules to reading and spelling. Students use “mouth pictures” to associate consonant sounds and mirrors to observe their own mouth and tongue positions as they produce the sounds. They learn to organize vowel sounds in a half-circle layout that represents the changes in tongue placement for the different vowel sounds. They learn labels for the vowel sounds (Smile, Open, Round, and Sliders) that focus on the shape of the mouth as the vowel sounds are formed. Students then learn to track, spell, and read consonant and letter sounds in syllables and words, using first colored blocks and later letter tiles. They practice sight and spelling words with air-writing. Patterned books, the Merrill Reading Program, the Merrill Skilltext Series and supplementary phonics materials are also used. Reading teachers may also use Preventing Academic Failure, an Orton-Gillingham curriculum for teaching reading, writing and spelling in the elementary classroom. This program presents a sequence of language skills that are practiced and reinforced until they are automatic. It is a structured, multisensory, word-analysis approach designed specifically for students with language weaknesses. Fluency – rapid, automatic reading – is necessary for good comprehension. Research has shown that fluency can be taught by repeated oral reading with feedback and guidance. To improve fluency, students practice repeated oral readings of text. This increases both reading speed and accuracy which leads to improved comprehension. Students practice reading phrases, sentences and paragraphs with expression. Teachers use PAF Stepping Up in Reading as well as extracting phrases from class novels. The Lindamood Bell Visualizing and Verbalizing Program is used to develop comprehension skills. This program develops both receptive and expressive language skills as well as visual imagery. Students begin by describing simple pictures, move on to sentence and paragraph imaging, and respond to higher order thinking questions. Story grammar is used to help students understand and organize story elements. This program features a long braid decorated with symbols representing narrative essentials (character, characters’ feeling, initiating story event, the plan for problem solution, story actions, and resolution). Students use these strategies when reading class novels and doing required daily home reading. Supplemental comprehension materials include SRA, Barnell Loft Specific Skill Series, and McCall Crabbs Standard Test Lessons in Reading, Daybooks of Critical Reading, literature anthologies and class novels. Depending on grade and reading level, students are required to complete and respond to a certain amount of reading each night for homework. The Villa Maria Reading Curriculum incorporates the learning objectives of the Connecticut English Language Arts Curriculum Framework. The Villa Maria program separates reading from grammar and writing into independent courses that together incorporate the goals and content standards of the state framework. Reading and language teachers work cooperatively to integrate learning in both areas. Kindergarten through grade 8 curriculum is organized separately from the grade 9 curriculum. The 9th grade curriculum is viewed as a distinct course but an extension of the lower grade level work. Major emphasis is on reading, thinking, writing, and study strategies to assist students to move toward greater proficiency in reading and to become independent learners. Students present varying reading ability, and the pacing and structure of activities in the curriculum reflect their differing levels. Some students need to develop basic reading skills, including decoding, word reading, comprehension, fluency in both oral and silent reading, and vocabulary development. Others may be reading on grade level and be able to interpret and evaluate more challenging texts. The instructional strategies target development of abilities to generate background knowledge; set purpose; be metacognitive and actively engaged in reading. Concepts are introduced and taught through modeling, guided practice and independent practice. All students receive individualized attention and immediate feedback. Materials and instruction are adjusted to meet the needs of individual students. All students are required to do independent reading daily. Language is a student’s most valuable tool, for without language, there would be no communication. The Villa Maria School language program seeks to develop the child’s communication skills of listening, speaking and writing so the child will be able to use language effectively. It is a developmental, sequential, and structured program. Handwriting and word-processing, grammar, usage, capitalization, punctuation, spelling, sentence and paragraph structure, and the writing process are integrated throughout the grades. Grammar and mechanics are directly taught. Learning about sentence structure and expanding sentences begins in kindergarten. The Voyages in English text and workbook is used. Daily proofreading practice utilizes either published Daily Oral Language books or teacher created materials related to curriculum themes. Students practice expanding sentences by adding details of who, what, when, where, and how. Students use structured outlines to organize simple paragraphs and longer compositions. Teachers select elements of the Windward Basic Writing Program, Story Grammar and Thememaker for developing descriptive, narrative and expository writing skills. Writing is presented as a process. Students use visual organizers and profit from a structured, systematic approach to organizing their thoughts and ideas and expressing them in written form. Students in grades 4 through 9 have writing labs with networked on-line computers available. All students practice keyboarding using Mavis Beacon Teaches Typing, Type to Learn, or Typing Instructor. Students are also introduced to additional computer programs, such as Kidspiration, Excel and PowerPoint in a separate computer class that meets weekly in the computer lab. Spelling instruction uses the multisensory strategies of the Lindamood Bell Seeing Stars Program, and is reinforced with additional materials, such as Spellwell and How to Spell. A new handwriting program has been implemented under the guidance of our occupational therapist. In the primary grades students use Handwriting Without Tears. Students do not practice writing in basic workbooks until they have experienced creating letters in several other mediums. They use wood shapes to create letters, trace letters in shaving cream, carve letters in clay, and write and trace letters on individual chalkboards. Older students use the Loops and Other Groups Program for cursive writing. Mathematics contributes to the development of the whole person by enriching one’s life and providing a practical tool for daily living. Students need knowledge of the basics of math to be successful in the pursuit of other academic and career subjects. The study of math helps students develop their ability to reason and think logically, as well as to discover creative ways of solving problems. At Villa Maria students are taught the basic concepts of math in a step-by-step approach. When appropriate, manipulatives are used to promote concept understanding. Traditional topics are taught in the context of real-world situations. Students are required to do computations and manipulate mathematical symbols, but there is a strong emphasis on the application of knowledge and skills. Problem solving exercises and application activities are integrated throughout lessons. Instruction begins with an emphasis on the essential skills of: number sense, estimation, pattern recognition, mathematical modeling, and builds in the upper grades to understanding functional relationships, data analysis, statistics, and manipulation of algebraic expressions and equations. Students develop the ability to use visual thinking, to make and check conjectures, to reason, and to provide convincing arguments. Students in the upper grades also investigate occupational opportunities requiring math skills. They use the calculator and are introduced to the use of spreadsheets to examine, analyze and solve problems. Instruction using a variety of modalities is included. The math program is designed to meet the four content standards outlined in the 2005 Connecticut Mathematics Framework. Instruction is multisensory. Students work at the appropriate skill level, while teachers provide remediation necessary to bring achievement to grade level. Knowledge of basic facts is reinforced, and strategies for calculations, conceptual understanding, and problem solving are taught. Lindamood Bell On Cloud Nine Math uses manipulatives, imagery, and language to develop fundamental math concepts necessary for reasoning and problem solving with numbers. Several factors are considered when selecting texts: difficulty of reading level, visual complexity of the pages, need for and amount of repetition and reteaching, math vocabulary, provision for connection between math and the real world, and problem solving strategies. In addition to Sadlier Math text and workbooks, supplementary books (Steck Vaughn Mastering Math, Globe Fearon Basic Math and Pre-Algebra, Curriculum Associates Math Mastery Series for practice with multiplication, division, fraction, decimals and percents) are used. The Math-a-Magician program is used in the lower grades to learn and reinforce math facts. The ninth grade algebra class uses AGS Algebra. Manipulatives include unifix cubes, numberlines, fraction shapes, decimal transparencies, Judy clocks, flashcards, teddy bear and other counters, abacuses, and many games, to name a few. Villa Maria believes that science education should provide a learning experience through which scientific inquiry can develop along with the opportunity to become scientifically and technologically literate. Students should understand major science concepts and theories, use scientific reasoning, and recognize the complex interactions between science, technology and society. They must acquire the background information necessary to grow scientifically, experience the joy of discovery through hands-on activities, develop and maintain the skills necessary to perform experiments, and acquire career oriented knowledge. The Villa Maria science curriculum is based on the Connecticut Core Science Curriculum Framework. It incorporates the main conceptual themes and content standards that students are expected to learn in their elementary, middle and high school science classes. Students develop an understanding of key science ideas as well as a fluency in scientific vocabulary. Fundamental concepts from the life, physical and earth sciences are woven together in order to promote the understanding required to be scientifically literate. Students also develop the ability to apply critical thinking skills to science-related issues. Hands-on activities make the scientific concepts accessible to students and help them understand how scientific knowledge is created and validated. They learn how to communicate scientific knowledge and make practical applications in the real world. Students are taught to appreciate the world in which they live and the importance of preserving our natural resources. They are encouraged to recycle, use natural products and the significance of environmentalism. The ninth grade biology course is designed to enable students to learn basic biological concepts and to provide students with successful lab experiences. Course content is modified according to the individual needs, interests, and abilities of the students. The course includes lab work, cooperative group work and project-oriented assignments. By studying biology, the science of living things, it is expected that students will learn not only about themselves and their environment, but also be prepared to make wise decisions that will affect life on our planet. The Villa Maria social studies curriculum seeks to concretize for students, in a manner and to the degree appropriate for their level of maturity, the social forces, historical events, and natural phenomena which have influenced and continue to influence human development. Students learn how interaction within and between human societies shapes the individual even as societies are shaped by the choices and value systems of individuals in those societies. Villa Maria strives to develop the students’ ability to make choices that will contribute to the betterment of the human condition. Students learn to identify, define, and resolve social problems. They are encouraged to develop a global perspective that will motivate them to recognize and accept responsible membership in the world community. Beginning in the primary grades with the study of neighborhoods and communities, students progress to the study of American history and geography, to the study of ancient civilizations, to the study of world history and geography. Course content at each grade level is modified according to the individual needs, interests, and abilities of the students. Teachers incorporate hands-on activities, art and craft projects, map study, and in-school and outside field trips. Students are also taught how to use a traditional textbook and primary source materials. They are required to do research using a variety of sources, and they read theme related novels to broaden their understanding of history. The Villa Maria social studies curriculum is aligned with the Connecticut State Standards. In the eighth grade World Geography and Cultures course, students learn to understand the different regions of the world and their peoples. They examine political, social, physical, and cultural aspects of life in different regions of the world and develop an appreciation of their place in our emerging global society. They learn about the geography of various regions, the physical features such as mountains, deserts, and oceans. They study the climate and natural resources, and the ways in which people interact with their environment. Students hone their map skills as well as their ability to use graphs and diagrams. They discuss topics of current interest, such as protecting our environment, preventing world famine, and improving world literacy. Understandings developed in this course provide students an excellent background for an in-depth study of Western Civilization in 9th grade. The Western Civilizations course is designed to make students aware of their place in the world, both historically and in relation to present-day issues, as well as the responsibilities we all share as part of an interdependent, global society. The course requires the use of the library resources and the Internet while doing frequent research on required topics. Students develop essential skills in note taking, organization, reading from primary sources as well as text, oral discussion, and written expression while acquiring important content knowledge. Students demonstrate an understanding of the basic knowledge of history, and apply this knowledge to real world circumstances.